Is there a better alternative to Hab.la? Is Hab.la really the best app in Chat category? Will Hab.la work good on macOS 10.13.4? 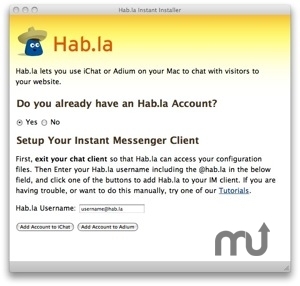 Hab.la allows you to easily chat with visitors to your website seamlessly through iChat or Adium. You'll get a cool floating window on your website in which visitors can send messages directly to your favorite instant messenger program. Visitors will show up automatically in iChat or Adium just like your other buddies. Mac OS X 10.3 or later, Internet access. Hab.la needs a review. Be the first to review this app and get the discussion started! Hab.la needs a rating. Be the first to rate this app and get the discussion started!